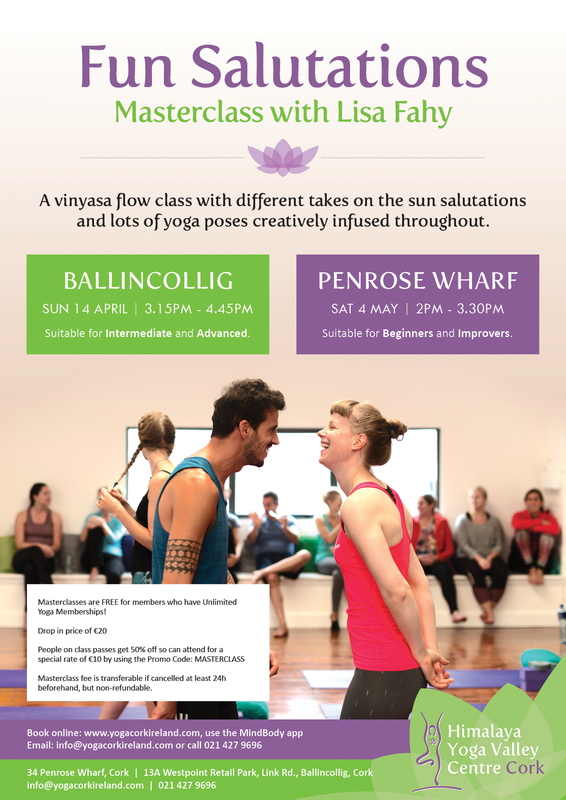 Join our senior yoga teacher Lisa Fahy for Fun Salutations- a vinyasa flow class with different takes on the sun salutations and lots of yoga poses creatively infused throughout. In the session you will work through some fun rounds targeting core, hips, shoulders, hamstrings, quads, balance and backbends and begin to go deep and cool down with moon salutations and floor poses. This well balanced class is great for overall health and wellbeing, improving immunity, circulation, digestion and endocrine health. The Level 1 class is suitable for New Beginnings Level 1 and New Beginnings Level 2 students (Beginner and Improvers) and takes place Saturday May 4th, 2pm-3.30pm in Penrose Wharf. The Level 2 is suitable for students from Bridge to Peak and Peak to Power and will take place Sunday, April 14th 3.15pm-4.45pm in our Ballincollig studio. Booking is essential-reserve your spot now through the schedule and booking section, on the Mindbody app or call us on 021-4279696 to avoid disappointment.